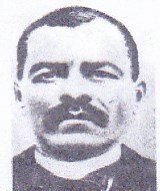 Representative Zachariah Wines. Born on November 12, 1847, Zachariah W. Wines, was the oldest son of Andrew and Susannah [Susan] Wines. 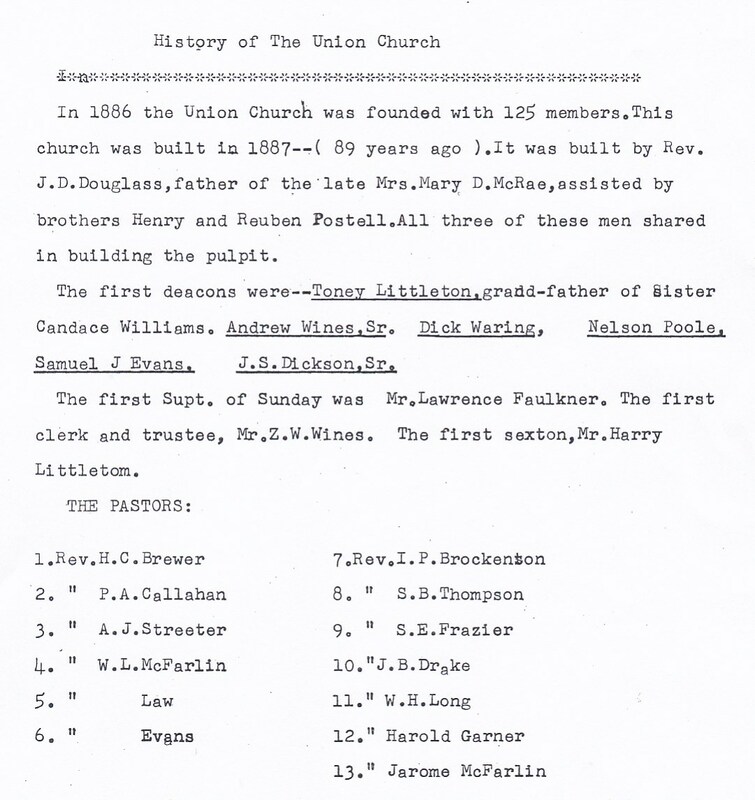 In the 1870’ U.S. Census, his father was employed as a Planter, along with his wife, and three other sons, Brook, Andrew, and Samuel, residing in Society Hill, S.C. After graduation from high school, Zachariah briefly attended Calver Institute in Richmond, Va. While attending college, he learned his father was encountering financial difficulties and was about to lose their land. 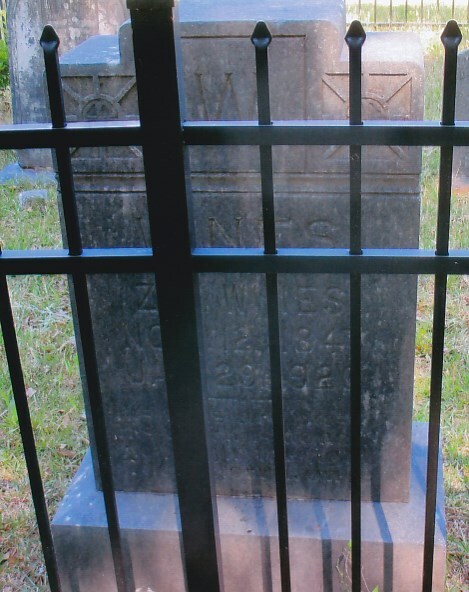 Zachariah immediately left college and returned to Society Hill to help his father redeem their property. His brothers were also in college. Upon learning of their father’s misfortune, each wanted to return home and aid in their father’s recovery. Since Zachariah was the oldest, he felt that it was his responsibility to discontinue his education for the betterment of the family. So he persuaded his brothers to remain in college and work toward their degrees. It was 1864’ and the country was in the throes of the Civil War. Upon returning home, Zachariah focused all of his interest in the family’s business and worked diligently to improve their lot. Through his hard work, he developed into a progressive and successful farmer, as well as, becoming owner and operator of a general merchandise store located in Society Hill, as noted in the 1880’ U.S. Census. Rep. Zachariah W. Wines' Merchant Store. Due to Zachariah’s ability to turn near tragedy into success, along with his unambitious nature, he was sought out by the leaders to serve in the 52nd General Assembly House of Representatives from 1876 -1878. During his service in the House of Representatives, he was commissioned Captain, in the South Carolina National Guard, by Governor Wade Hampton, on October 17, 1877. 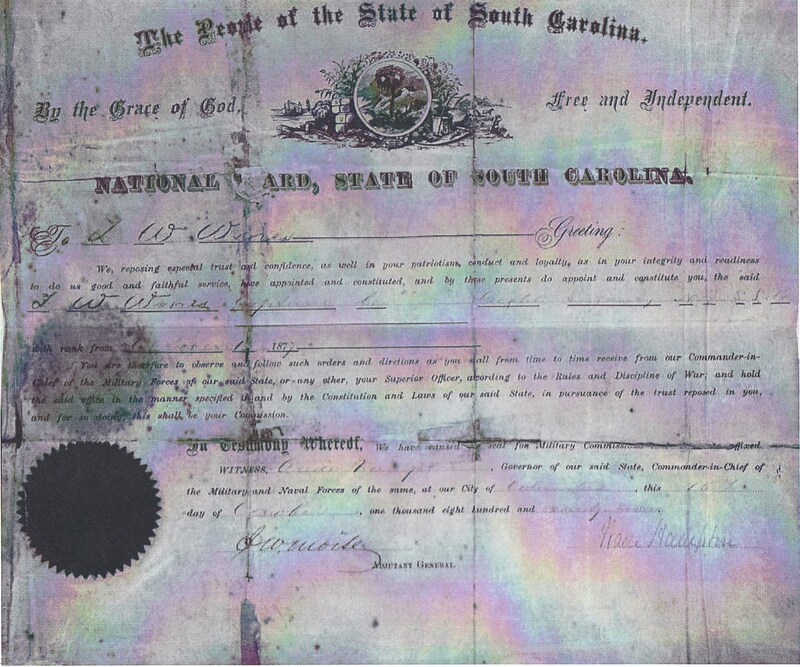 Representative Zachariah Wines' S.C. National Guard Appointment Certificate by Governor Wade Hampton. Upon leaving the House of Representatives, he continued to serve the Darlington County Republican Party as Secretary in April 19, 1888 at the State Convention and subsequent years to follow in Sept. 1890, Sept. 1892, and Sept. 1900. After his period of service to the House and National Guard, he returned to Waddell School as a Teacher in 1879. 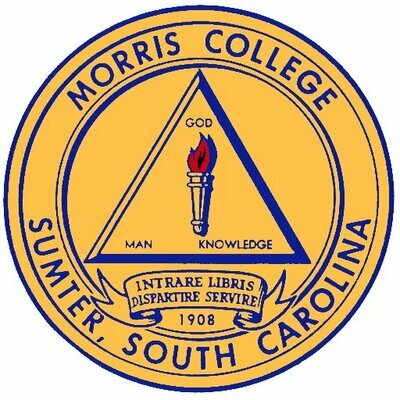 In helping African-American Colleges of Higher Learning, he had a student dormitory constructed at Morris College, Sumter, S.C. In a storied career of public service, he was elected Society Hill, S.C. Postmaster on October 30, 1897. At the end of his life, Zachariah owned nearly 1,500 acres of land in four counties: namely, Darlington, Florence, Chesterfield, and Sumter. U.S. Postmaster Appointment - Zachariah Wines (Society Hill), October 30, 1897. Rep. Zachariah W. Wines Headstone. 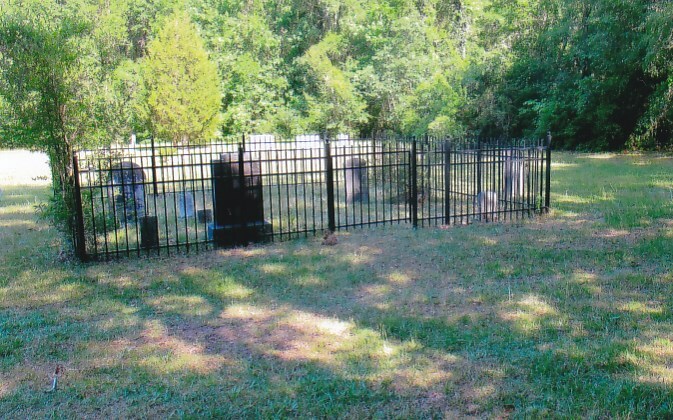 Rep. Zachariah W. Wines' Family Cemetery Plot. As the Ecclesiastes writer would pen many centuries ago to the various seasons, there is a season to honor. 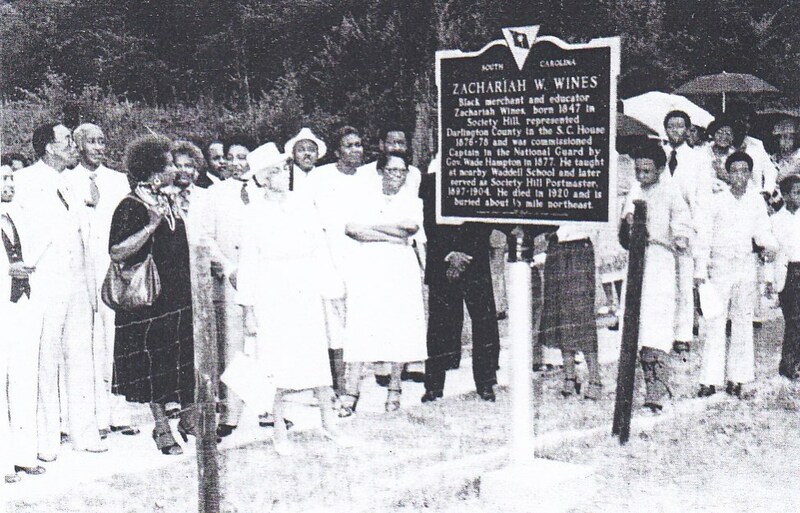 In 1979' in honoring the many contributions of African-Americans often over looked during the season of disregard, Rep. Zachariah W. Wines received a Historical Marker 16-21 on Cheraw Street, Society Hill, S.C. by the Darlington County Bicentennial Committee for Ethnic Participation, with a community of well-wishers looking on. Marker 16-21, Zachariah W. Wines. 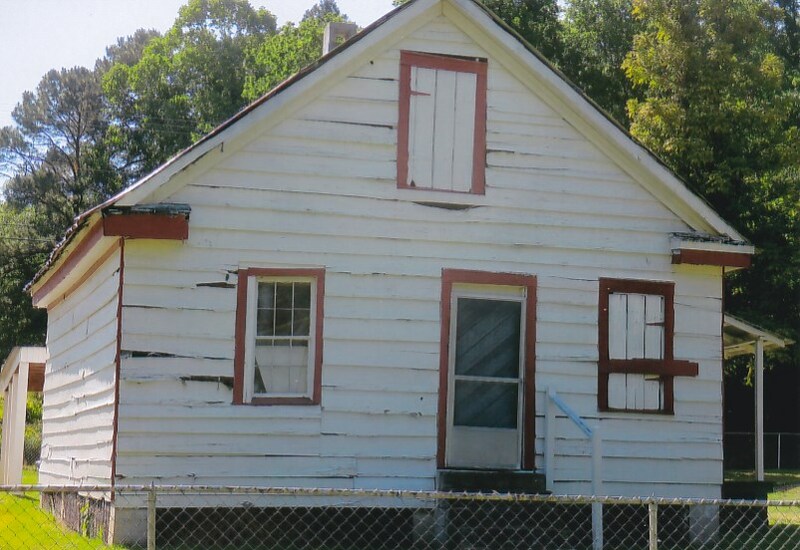 in the S.C. House 1876 - 78, and was commissioned Captain in the National Guard by Gov. Wade Hampton in 1877. 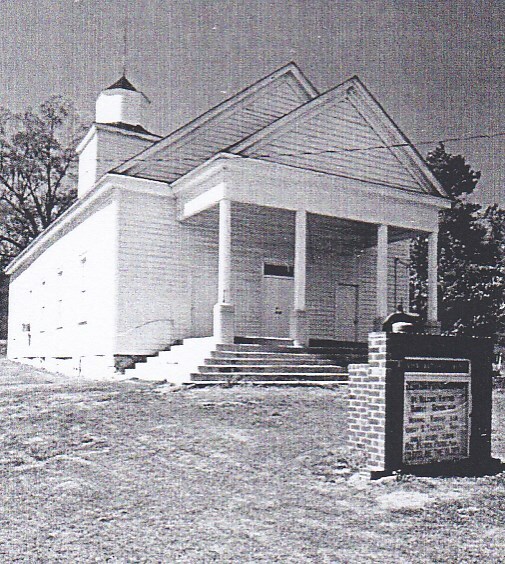 As a member of Union Baptist Church in Society Hill, S.C., he became a trustee at an early age as well as first clerk, serving untiringly, for many years.